The largest coastal lagoon in India and the second largest coastal lagoon in the world, Chilika Lake is a brackish water lagoon that acts as a home to a plethora of migratory species besides the native plants and animals. Waders, waterfowl, raptors, reptiles, amphibians and the rare and endangered green sea turtle, blackbuck, fishing cat, limbless skink, spoon-billed sandpiper and Irrawaddy dolphins flourish here along with microalgae, seaweeds, seagrasses, dugongs, fish and crabs. The rich fishery resources can offer you a golden opportunity of fishing. Several islands are there for exploring, such as Parikud, Phulbari, Nalbina, and Tampara. All you need is to take a boat ride along the lake while exploring the white-bellied sea eagle, greylag geese, purple herons, brahminy ducks and many other native birds. As an added bonanza, Nalbina Bird Sanctuary stands on the wetlands of Chilika. An ideal Bhubaneshwar trip includes top things to do in Bhubaneshwar like Lingaraja Temple, Nandankanan Zoological Park, Udayagiri And Khandagiri Caves, Dhauligiri Hills and Shree Ram Mandir. Local travel guides will amplify your fun in the city as they walk you around the major attractions. You can book Bhubaneshwar tours for such assistance. Create a customized plan for your visit using the Bhubaneshwar trip planner. You can use ready templates or start from scratch for the same. Add comfortable hotels to your plan, choose from the recommended hotels in Bhubaneshwar like Mango Hotels Prangan, Oyo 4209 Maurya Inn and The New Marrion. Find out how to reach Bhubaneshwar to begin with. Plenty of wholesome Bhubaneshwar vacation packages are available to choose from, pick your today! 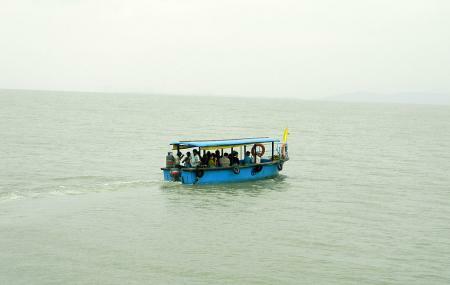 How popular is Chilika Lake? People normally club together Chilika Wildlife Sanctuary and Raghurajpur while planning their visit to Chilika Lake. Chilika Lake is a brackish water lagoon spread over the Puri , Khurdha and Ganjam districts of Odisha state on the east coast of India, at the mouth of the Daya River, flowing into the Bay of Bengal, covering an area of over 1,100 km2. It is the largest coastal lagoon in India and the second largest coastal lagoon in the world after The New Caledonian barrier reef in New Caledonia. I never had a boat ride before this. It was my first experience and I really loved it.